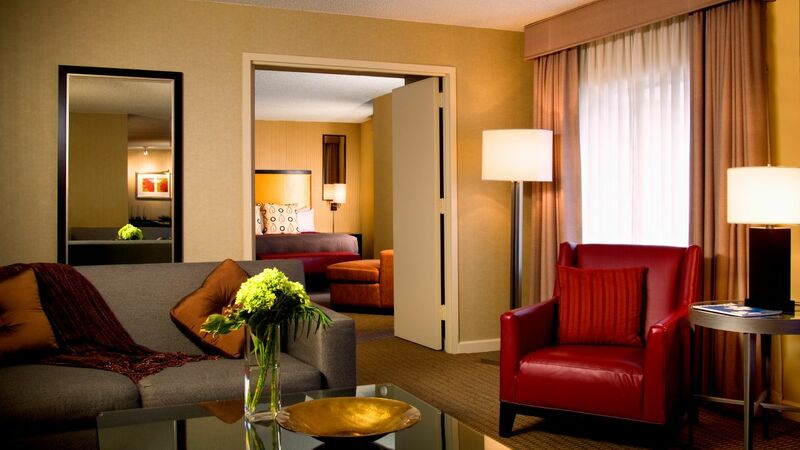 Hyatt Regency Deerfield offers modern and spacious hotel accommodations for your stay in Deerfield, IL. Rooms and suites feature modern amenities perfect for making your work week, vacation, or extended stay experience “feel like home”. All accommodations include a comfortable Hyatt Grand Bed, work desk, 37” HDTV, coffee maker, and mini-fridge. Suites offer more space to relax with a separate living room and bedroom. 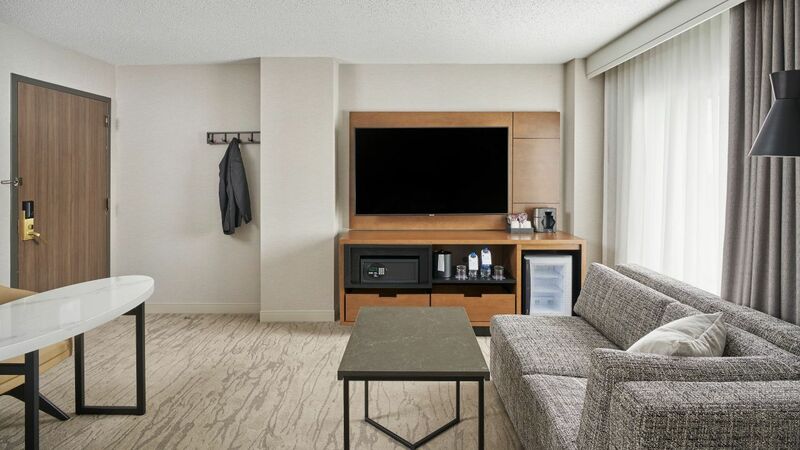 Entertain lavishly in our Executive suite, featuring luxurious amenities and contemporary elegance. From a separate parlor with an executive board table for eight to two spacious bathrooms with deluxe Portico products, fluffy robes and a curved shower design, these 726-square-foot VIP Chicagoland hotel suites are exquisite. This is a standard suite. See World of Hyatt program terms for upgrade eligibility. Entertain lavishly in our Presidential suite, offering luxurious amenities in a contemporary elegant setting. 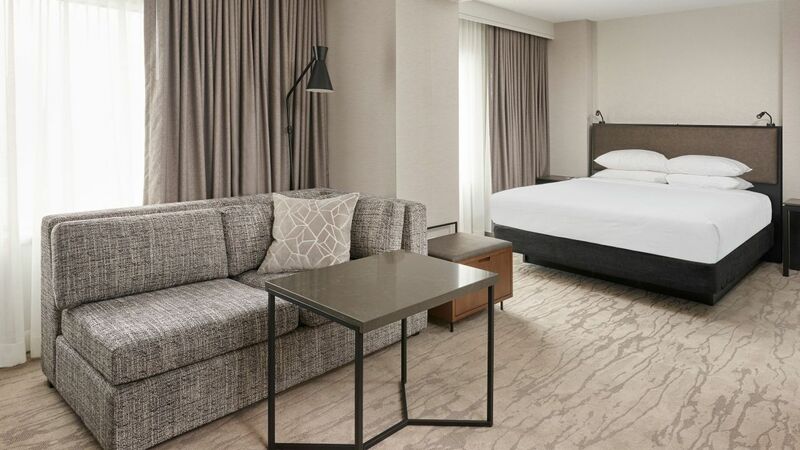 From the separate living area with dining / board table for eight, wet bar and guest bath to your own spacious bathroom filled with deluxe Portico products, fluffy robes, soaking tub and a separate shower design, this1,068-square-foot VIP Chicagoland hotel suite is exquisite. Modern décor in calming earth tones surrounds stylish furnishings and remarkable features, including a complete Bose stereo surround sound system, Playstation, DVD / CD player, selection of DVDs, CDs and games, three flat-screen televisions, desktop computer with printer, refrigerator, sound soother, iHome stereo with iPod dock, weather clock and wireless high-speed Internet access (fee applies). French doors lead to a separate bedroom with an irresistible king-sized Hyatt Grand Bed™ covered in upgraded linens and thick down blankets piled atop a plush pillow-top mattress. 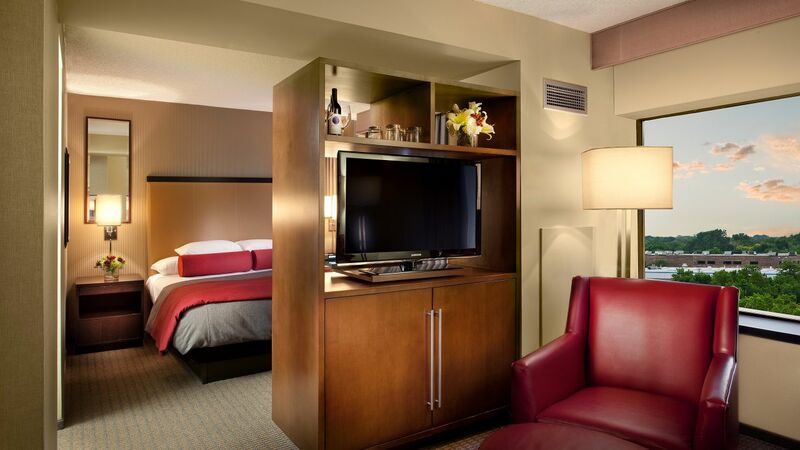 These extraordinary accommodations at our Chicagoland area hotel are simply beyond compare. This is a premium suite. See World of Hyatt program terms for upgrade eligibility. Find comfort in this quiet and spacious room featuring a king bed, separate sitting and work areas, and a stunning granite bathroom. Unwind in this spacious room featuring two double-sized beds, a generous work space, and separate sitting area. This Americans with Disabilities Act-compliant guestroom features one queen bed and accessible shower. In addition to all or most features of the corresponding non-ADA room type, this room includes closed-caption television, cordless phone and standard fire alarm system with additional emergency strobe light and strobe-light smoke detector. Key entryway, bath, lighting and climate-control features are positioned at a lower height for ease of use. Other ADA-compliant bathroom conveniences include wide doors, grab bars and raised toilet seat. This Americans with Disabilities Act-compliant guestroom features one queen bed and accessible tub. In addition to all or most features of the corresponding non-ADA room type, this room includes closed-caption television, cordless phone and standard fire alarm system with additional emergency strobe light and strobe-light smoke detector. Key entryway, bath, lighting and climate-control features are positioned at a lower height for ease of use. Other ADA-compliant bathroom conveniences include wide doors, grab bars and raised toilet seat. 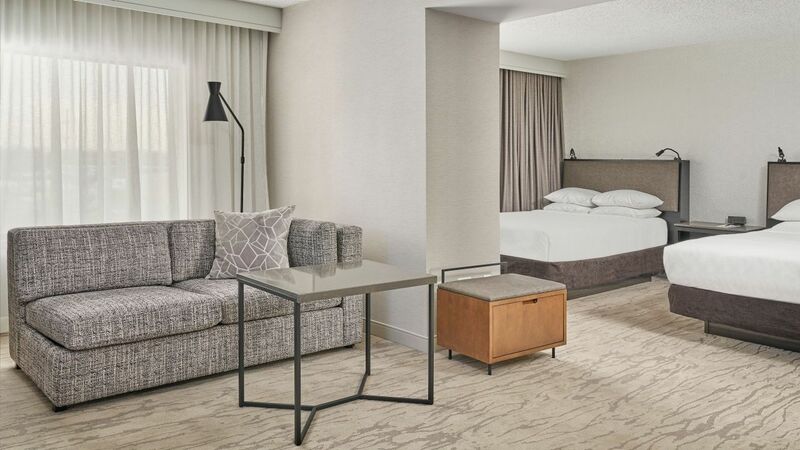 Enjoy a suite-sized Business Plan guestroom featuring luxurious amenities and contemporary elegance at Hyatt Regency Deerfield. Take advantage of our complimentary full breakfast for one adult, free local calls and full-service business center to stay productive. 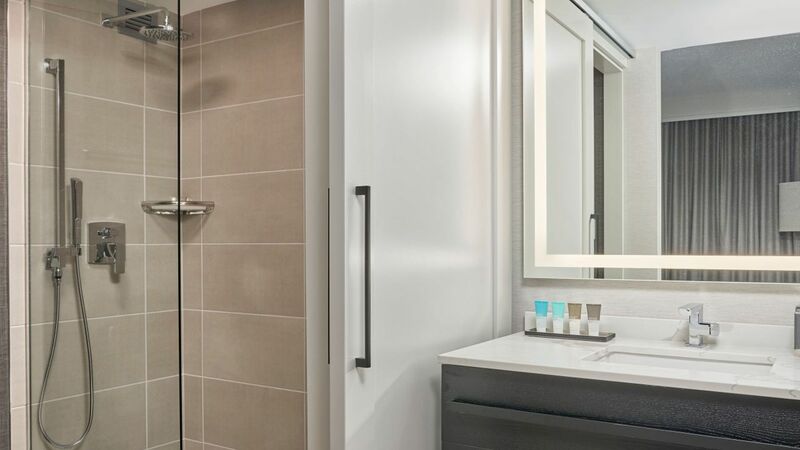 From separate sitting and work areas to a spacious bathroom with deluxe Portico products and a curved shower design, our 363-square-foot Chicagoland hotel rooms are exquisite.